With this tool you can freeze physic objects. But it's a special kind of freeze, which is also called 'sleep'. Sleeping physic objects can't move like frozen objects. But if any force (except gravity) is applied to the object, it moves again. 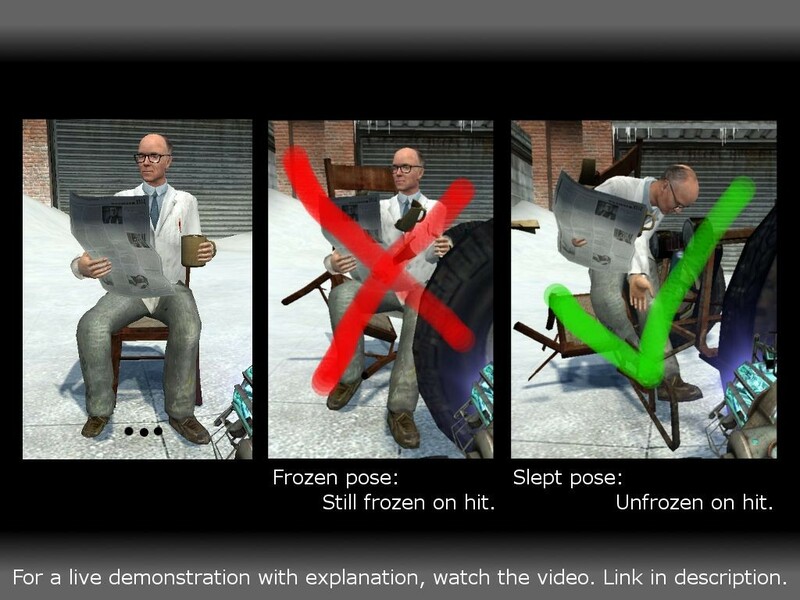 You can use this tool for example on buildings or posed ragdolls. Then they keep being frozen until they get hit by a car, a bullet, a bomb or any other forces and collapse or fall on the ground. It's an useful tool when you want to film for example a person in a special pose who will get punched soon or a building that collapses after being hit by a missile. You can use it just for fun too. Make an army of aiming snipers holding weapons and set them asleep. Then use the car or any prop and play bowling with them. Or watch a self-made bridge collapsing while you are standing on it. Put the 'SleepnWakeSTool' folder to '...\Steam\steamapps\YOURNAME\garrysmod\garrysmod\addons'. Primary fire: The whole physic object will be unfrozen and set asleep. Any force is able to 'unsleep' the object. Secondary fire: The whole physic object will be frozen. Useful to undo accidentally placed sleeps. Reload: The whole physic object will be unfrozen and awaken. Actually, it's the same as breaking a sleep with any force. DO NOT REUPLOAD IT ON ANYWHERE WITHOUT MY PERMISSION! All credits goes to me (JokeSpeaker).